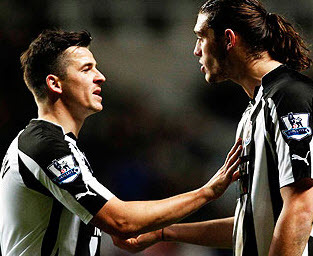 Barton in new deal speculation – Carroll is NOT for sale | NUFC Blog. Reports suggest that Joey Barton is soon to sign a new five and a half year contract with Newcastle United and Alan Pardew reiterates that Carroll is not for sale. Apparently negotiations are underway to keep Joey Barton at Newcastle until (pretty much) the end of his playing career. It is reported that Barton is prepared to take a £10,000/week wage drop to remain at Newcastle, which will drop him down to the £50,000/week that is allegedly the club’s maximum wage. Barton has been in stunning form this season and has recently been making his case for an England recall. He has scored 3 times for us this season – including an absolute cracker against Stevenage in an otherwise disappointing game – and his passing has often been inch-perfect. Beware though, some of these reports are coming from the red tops. Having said that, I can actually see the reports as having some truth in them. Apparently West Ham and Aston Villa fancy signing Barton if his negotiations with Newcastle grind to a halt, although both those teams look to be in a lot more trouble than us this season and I can’t see Barton being particularly tempted to join either of them. In addition, Alan Pardew has once again reiterated that Andy Carroll is not for sale. “They can put together whatever they like. He is not for sale. “He’s a good player, he’s a handful, you’d like to have him in your team. Hopefully that’s put the issue to bed, although I’ll still be relieved when the transfer window closes and Andy Carroll is still with us! I think if we can keep improving our squad, we can fight or even better than Tottenham within 2-3 years. I don’t see any reason why we should sell one of our best player to them. I really believe it. Regarding AC, it’s pretty pathetic that AP, the club and the player all have to keep saying the same thing. You still get people banging on about him on here when it’s pretty plan that he’s going nowhere. Please – an end to it now? I have no problem believing Barton will take a cut to stay; I think he’s genuinely found his spot here and knows he’d have to build from scratch anywhere else. He’s not daft (angry – yes, daft – no) so a few mil here and there is less important to him than the right environment to do his thing and keep his demons at bay. As for speculation on money – all made up, of course; nobody has a clue. I don’t think Ashley is so naive that he doesn’t have a realistic expectation of what he has to pay top players. But he’s no mug either and won’t try to compete with Citeh and co. He’ll bide his time and build slowly while the new rules take hold and the playing field levels. £200k/week deals just aren’t feasible any longer. Thank gawd/platini. That’s all set in stone. If the FA cup winners haven’t finished in the top 5, they get UEFA cup qualification, otherwise it goes to the runners up, if both have finished it in the top 5, it goes to 6th placed in the league. Likewise if the League cup winners havent already qualified, they take the place, HOWEVER, the runners up don’t get the place if the winners have already qualified, it goes to 7th place in the league. In addition to this, the team finishing below the league’s european qualifiers gets into the Inter Toto Cup. So… potentially, if Arsenal win the league cup, and two of the top five get to the final of the FA cup, we would only need to finish 8th for inter-toto. It’s really really doable isn’t it. I wouldn’t at all disappointed if it didnt happen, as i still maintain that survival is our aim, but it certainly is possible! admire y’spirit mate, & sweet if it happened, but i won’t be holding me breath like. Rumour that Mackems want to sign Owen from ManU. Do you believe it ? Would be interesting to get Barton’s view of this. Does he want to play hollywood balls really – or would he rather get it on the deck and do an arsenal ? Couldn’t have owt to do with Tiote not playing, could it? Barton’s first outlet is Tiote. has everyone slunk off to uncle simon’s? Do i get a loyalty bonus? Enrique is just as much off a priority to getting him signing a new contract as Barton, I love Enrique and I think he is the future of Newcastle and Spain in the LB position. I would not be suprised if he wrapped himself some serious interest, but he’s said that he would like to stay here for the rest of his career, let’s hope so. He has quickly become one of my favorite Newcastle players. Coloccini has been playing so well recently, I wonder if he would remain at this club even if he had to take a 30k wage drop? Gutierrez, I’m not sure, I’m pretty sure we’ll see him working a lot harder when we get HBA back. But Make sure we get Enrique under a 10 year contract or something then I’ll be happy.